Improve safety. Curb bullying. Reduce driver distraction. 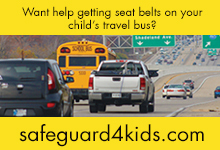 SafeGuard can help you make a world of difference on your school buses. NHTSA has made their position clear. 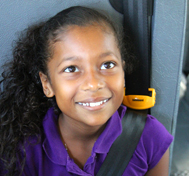 All school buses should have three-point lap-shoulder belts. Period. 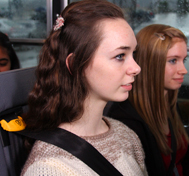 At SafeGuard, we agree, because the benefits seat belts bring to students, their drivers, and their districts, is significant. 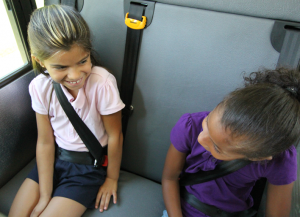 The Academy of Pediatrics, NHTSA, NASDPTS, and parents all over the country are onboard with lap-shoulder belts on school buses, and here’s why. From a fender-bender to a rollover, SafeGuard products are designed to reduce injuries and save lives. We took safety further by inventing SmartFrame technology to enhance compartmentalization, so both belted and un-belted passengers have increased protection in a collision. But when it comes to the most serious kind of accident, a rollover, the benefits of lap-shoulder belts become vividly clear when compartmentalization fails. Incorporating SafeGuard lap-shoulder belts with an enforced usage policy keeps students safer from events like this and even sudden stops where a child could receive anything from a head injury to a broken bone. In districts with such policies, they report compliance at nearly 100%. Every day, in every district, children get rowdy on the bus. They stand up in their seats. They turn around and talk to the children behind them. They walk the aisle. Compartmentalization only works when students are sitting in their seats, facing forward, with their feet on the floor. When districts use lap-shoulder belts, along with an enforced usage policy, many can’t believe the impact it makes on discipline. Bullying isn’t becoming an epidemic – it is one. This hot button issue is unfortunately facing too many school districts that are struggling to find ways to curb bullying and protect the victims. When it comes to bullying on the school bus, SafeGuard seats, along with assigned seats and an enforced usage policy, can make a big difference. When children are in their seat belts, behavior problems decrease. This means drivers are not only less distracted, but they are more satisfied with their job. SafeGuard seat belts are not only the most comfortable seat belt on the market, they are also engineered to be easy to use. Students can quickly adjust the sliding shoulder latch plate for a more comfortable fit. The retractable tongue also prevents the belts from being used as a weapon, and keeps it out of the way when all the belts are not in use in one seat. The seat belt also meets all federal safety standards, which means it will release with the same amount of pressure, even if the student is suspended upside down in their seat after a rollover. This can help drivers evacuate children more quickly who have remained in their seats and are calmer after a crash, as opposed to children being thrown around the interior of the bus and possibly injured when they do not have the added protection of seat belts. Watch the eye-opening results of the crash test demonstration we conducted for ABC News.